AMES, Iowa — Things were going well for Nazareth Mitrou-Long when he took the court at the Lloyd Noble Center in Norman, Oklahoma, on Feb. 9, 2015. Naz and No. 14 Iowa State were taking on No. 17 Oklahoma, one of the bigger games for the Cyclones in their Big 12 Conference slate that season. Naz opened the game with a 3-pointer. He quickly followed it up with a dunk. Things were fine. It was business as usual. Naz was in the middle of his junior campaign, one in which he truly established himself as Iowa State’s premier 3-point shooter. But that night in early February, even though the average Cyclone fan saw Naz play well, something was off. Naz subbed out of the game in his normal rotation. He approached his seat on the bench, and that’s when he knew something was wrong. Almost instantly, the national audience watching the game on ESPN’s Big Monday started criticizing him. “Naz is having a great game, so he wants to go to the end of the bench and lay down,” someone tweeted at him. Several more tweets and comments followed. Naz, Iowa State’s 3-point guru, looked like he was loafing around at the end of the bench. He was having a good game, so why not kick back and relax? He had earned it, right? “For people to see that, they probably didn’t know why I was doing that and [were] thinking, ‘I just wanted to do that because I could do whatever I felt,’” Naz said. An excruciating pain, one that had been slowly chipping away at him all season, engulfed him, forcing him to lie down at the end of the bench. It was all that he could do to catch his breath. Naz didn’t call it quits, though. He finished the game with 14 points, the 15th time that season he finished in double figures for the Cyclones. But it was then that he knew something was truly wrong. The pain that had been jawing at him all season was making itself known. He couldn’t ignore it any longer. So a month later, just days after Iowa State fell to UAB in the NCAA Tournament, Naz went into surgery. Doctors repaired two torn labrums in his hips and scoped part of his hip bone. And for the next seven months, the one thing in Naz’s life that always made sense was gone. He had to step away. “I genuinely love this thing, man. This ball, I love this game,” Naz said. “Everything it’s done for me, it’s made my life so beautiful, man. I appreciate it. He wanted to play Division I basketball in the United States. A Canadian high school student doesn’t easily accomplish that feat. Most college scouts simply aren’t looking at the basketball scene north of the border. So he left to attend Montrose Christian, a prep school in Rockville, Maryland, where he averaged 8 points and 5 assists per game. After that year, Naz transferred to Findlay Prep in Henderson, Nevada. While he didn’t see the court much that year in Nevada — thanks to the stocked roster that included Anthony Bennett, Myck Kabongo, Nick Johnson and Landen Lucas, among others — his basketball game reached a new level, Naz said. It wasn’t until after the Nike Peach Jam, one of the best tournaments on the AAU circuit, that following summer that Naz started getting college offers. And once he connected with then-coach Fred Hoiberg and took his visit to Ames, his decision was made. He was a Cyclone. “I’d never seen anything like that,” Naz told the Daily. “The athletics out here, you can’t compare to Canada. So when I saw Jack Trice and the football game, I fell in love with that. So Naz moved to a state he had never heard of and started settling in. But during his freshman campaign, his role on the team wasn’t quite what he had hoped. Naz saw action in just 18 games that year, averaging 1.4 points and 1 assist per contest. Essentially, he got scrub minutes. He knew that going into the season. It wasn’t a shock. Naz just took what he got and ran with it. “I’m a guy who it takes a little second to learn some things, but once I get it down I’m going to give my all, 110 percent to make sure I’m doing my best at it,” Naz said. While many freshmen would have been frustrated not getting much playing time, Naz’s mom, Georgia Mitrou, said it wasn’t an issue for him. Naz’s sophomore year was better. He was filling a sixth-man role and doing well. He played in all 36 games that season, averaging 7.1 points per contest and shooting 40 percent from behind the arc. Even though he didn’t get a lot of playing time, or even all of the recognition he may have deserved that year, Naz was doing everything he could in his role. Senior guard Matt Thomas, who was a freshman at that time, said Naz’s leadership hasn’t differed since he first met him that season. On paper during his junior season, Naz was playing fantastic. He started in all but one contest that year and averaged more than 10 points per game. He even hit a team-high 77 3-point buckets that season. But it wasn’t that easy. The pain in his hips was eating at him again. Georgia said this pain was nothing new for Naz. Yet all through his junior season, Naz would talk to his mom about the pain that had returned. “No, I’m OK. I can do this. I’m OK,” Naz told his mom over the phone one night. “If you’re not feeling good, just sit out,” Georgia told him. “No mom. I got this,” he said. He was resilient. He refused to sit out. Naz Mitrou-Long reacts during Iowa State's loss to Oklahoma at the 2016 Big 12 tournament in Kansas City, Missouri. Photo by Max Goldberg/Iowa State Daily. So he stuck it out, waiting to have the surgery until the season was over. Naz then took time off. Seemingly recovered after his offseason break and rehab from the procedure, Naz entered his senior season making national headlines. The Cyclones were good. 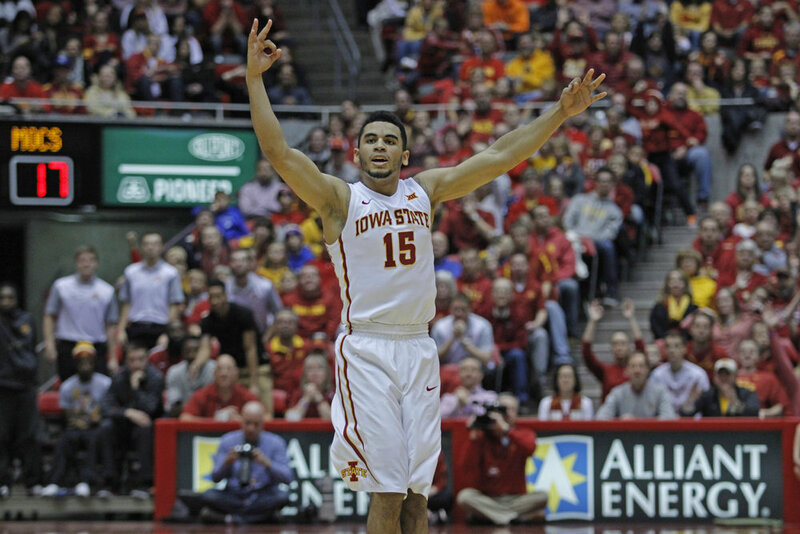 Led by All-American Georges Niang, Iowa State started the season ranked No. 7 in the country. While Naz looked good on paper, even going 5-of-9 from the field for 13 points in the season opener against Colorado, he was still struggling. Georgia, who watches nearly all of Naz’s games on TV, was watching one night early that season. “I saw him sitting on the bench. Then I saw him on the court. Then all of the sudden, I didn’t see him anywhere,” Georgia recalled. “It’s unlike Naz to be somewhere else. He’s always with his team. It was like the Oklahoma game all over again. Naz couldn’t sit on the bench. He was in too much pain. That night after the game, Georgia called her son. The pain wasn’t just hurting him physically. It was killing him mentally, too. By the fifth and sixth games of the 2015-16 season, Naz knew he was running out of time. If he wanted to seek a medical redshirt, he couldn’t play more than eight games. But Naz didn’t want to give up just yet. Naz played in the Cy-Hawk basketball game against Iowa, Iowa State’s eighth game of the season. Right after the game, he sat down with Iowa State coach Steve Prohm. He called the entire team over to his apartment one night and broke the news. He was stepping away. Prohm knew Naz was crushed, too. He watched Naz battle with this decision all season and understood how hard it was for him. And just like that, only eight games into the season, Naz’s senior year was over. Naz and the Cyclones were standing in the back hallway of Hilton Coliseum. It was the ninth game of the 2015-16 season, and Iowa State was about to tip off against Arkansas-Pine Bluff. It was the first game since Naz decided to hang up his jersey for the year. The team broke its pregame huddle. The players started to run out of the red double-doors, slapping the Iowa State mural atop the doors before stepping out into the bright lights of Hilton Coliseum. It was the first time in his career that he would walk out onto the court in street clothes. It was the first time at Iowa State that he wouldn’t be an option in the game. It was the first time he would be tied down to the bench. Georgia, who was once again watching on TV, texted Naz after the game. He didn’t answer. Then she FaceTimed him. Still no answer. Finally, she just left him a text. “Call me when you’re ready to talk,” it read. When she eventually got hold of him, Naz was still devastated. At that point, the dynamic of the team had changed. One of its senior leaders was no longer on the court. Prohm knew that, even though the team was in a different place, he couldn’t afford to lose Naz for good. He had to do something. “The biggest thing then was, ‘Hey, come with us. Help coach this team. Help keep these guys encouraged,’” Prohm said. And Naz did. Once he was able to get over the initial impact of not playing, Naz’s mentality changed completely. He had become an assistant coach of sorts. Throughout the rest of the season, Naz was right there on the bench cheering on his team. He was right there in the huddles, giving tips and advice. And his team responded well. Throughout all of last season, Naz felt healthy at times. Especially late in the season, Naz would be in the gym working out and he would feel like his old self. But the consistency wasn’t there. Naz wanted to be back out there. He wanted to retake the court. He contemplated coming back, especially right before the conference tournament started. So that’s what he did. He rested. That entire season, Naz slowly started to get back into the gym. He said that process, though, was one of the toughest. Once Iowa State fell to Virginia in the Sweet 16, Naz took five weeks off. He rested. And once he was ready, he retook the gym. Prohm likes where Naz is at. Naz Mitrou-Long guards a Colorado player in the Cyclones' 2015-2016 season opener in Sioux Falls, South Dakota. Photo by Ryan Young/Iowa State Daily. “Right now he’s playing the best basketball I think in his life,” Thomas said. After a painful two seasons, Naz is finally back. The pain he has felt off and on since he was 15 years old is gone, nowhere to be found. This is exactly where Naz wants to be. “It was everything I had dreamed of since the day I got my surgery,” Naz said.